When it comes to choosing a new boiler, a combination boiler is probably high on your list. After all, combination boilers are the most popular boiler option in the UK. And there are a number of reasons for this popularity. Here at Charter Heating, we are leading boiler experts. As a result, we have produced this guide to the advantages of combination boilers. Why are combination boilers different? Combination boilers are different to other boiler options, because they provide heating and hot water at once. Taking power and water straight from the mains to distribute around the home. This means that there is no water storage tank. Most combination boilers also use condensing technology to heat the water more efficiently, and provide an energy efficient service. Some of the older conventional boilers lack this technology. What are the advantages of combination boilers? 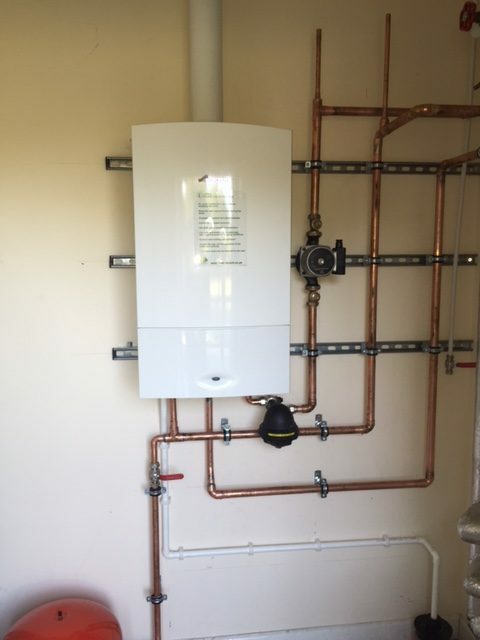 Provide unlimited hot water, without waiting for a tank to fill – this means that you will never run out of hot water, unlike with a conventional boiler. So larger families can all have a shower in the morning, without fear of using all the water. However, this also means that hot water cannot be provided to multiple taps at the same time,without a drop in pressure and temperature. Be fitted into a smaller space because they take up less room- With no storage tanks, combination boilers can be installed in kitchens, bedrooms and bathrooms. And they don’t need to be confined to the loft, basement or garage. Use less pipework- With no tanks to link to, there is a lot less pipework to install, which can lead to an easier and quicker installation. Provide good water pressure – Because the water is provided directly from the mains, the water pressure is usually good. If you are looking for a new boiler installation, or need more advice, why not contact the experts at Charter Heating.